ELTA CREME provides the highest level of concentrated protection and hydration for problem skin areas. 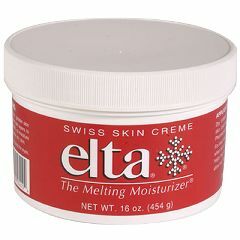 Elta Creme melts on contact, penetrating the skin to help damaged and dry skin retain its natural moisture and heal. Elta delivers twelve hours or more of superior moisturizing power and will not irritate the most sensitive skin. Use daily on any skin area requiring the highest level of moisturizing protection. Elta Creme is the leading product in hospital burn centers, radiation oncology and for diabetic dry skin conditions. This includes legs and feet, but not between the toes. Clinical studies have demonstrated it is safe for all skin types, non-comedogenic, sensitivity and fragrance-free, latex-free and contains no preservatives. Burns: 1st and 2nd degree burns as well as sunburns, healing grafts and donor sites, scar massage, under compression garments. Dry Skin Associated with Diabetes: Helps stop drying and cracking skin. Radiation Oncology: Helps soothe tender areas resulting from radiation therapy. Wound Care: Lubricates skin, loosens non-viable tissue, protects peri-wound area, and under zinc compression boots & compression therapy. Night Cream: Safe around the eyes for removing waterproof makeup and for treating eye dermatitis. Medication Side Effects: Relieves irritation, redness and flaking caused by some medicaitons, including Retin-A and Accutane treatment. Elta Creme Ingredients: Petrolatum, Paraffin, Mineral Oil, PVP Eicosene and Copolymer. Directions: Apply small amount at any time to risk area, but should ideally be applied after washing or hydrating and at bedtime, to trap in maximum moisture. Apply twice daily, as needed, and allow Elta Creme to soak into skin. Chronic dry skin on diabetics, renal patients, etc. How To Apply Elta Creme: For best results, moisten skin first or apply after shower or bath when skin is moist. Elta® does not evaporate like moisturizers that are primarily water, so a little goes a long way. If skin feels "greasy" a minute or two after application, more was applied than skin can absorb. Remove excess with a tissue and use less next time. Soothes Skin. Lightweight. Moisturizes. Smells Great. Softens Skin. Non-Greasy. instant results. Daily Use. dry flackey skin. I work in a nursing home and see a lot of old,dry, crusty, flackey skin.I have not seen a product work as well or as fast as Elta - Melting Moisturizer to improve skin. After just a few days the flackeyness is gone and after a week or two(depending on the severity of the crust)it too is easily removed and reveals beautiful,smooth,pretty skin. One word for this product is FABULOUS. by Mary the wound nurse from League City, Tx. Non-Greasy. Softens Skin. Moisturizes. Soothes Skin. I'm diabetic,it's great for my legs. This product was recommended to me by the wound care center at the local hospital. Great after shower moisture retainer. I have used this product for years. Lightweight. Soothes Skin. Moisturizes. Smells Great. Softens Skin. Non-Greasy. I bought this for my girlfriend. She swears by Elta and uses it all over her body. She also massages my shoulders with it. It helps with my arthritis. This is the best moisturizing cream . Soothes Skin. Moisturizes. Softens Skin. I love this moisturizer..
Daily Use. Sensitive Skin. Face and body..
A little goes a long way. A 16 oz. jar will last for months. Does Elta Creme contain lanolin? It seems to make my skin itch, and I am allergic to lanolin. Cusean this be used after radiation from removal of breast? Friend had cancer, was given cream to use but to get more of same wld cost her more can $80. Use of Elta cream after radiation is one of the suggested applications by the manufacturer so it would likely be a good choice.